On my second visit to Miyajima, I wanted to see more than the Itsukushima Shrine and its famous torii. I headed towards higher ground, to Daisho-in, a Buddhist temple built along the mountainside. A series of stone stairways took you ever so higher, punctuated by multiple levels of elaborate wooden buildings. While Itsukushima is a sprawling structure built flat on the water, Daisho-in is impressive in another way, revealing itself in stages as you climb the heights. 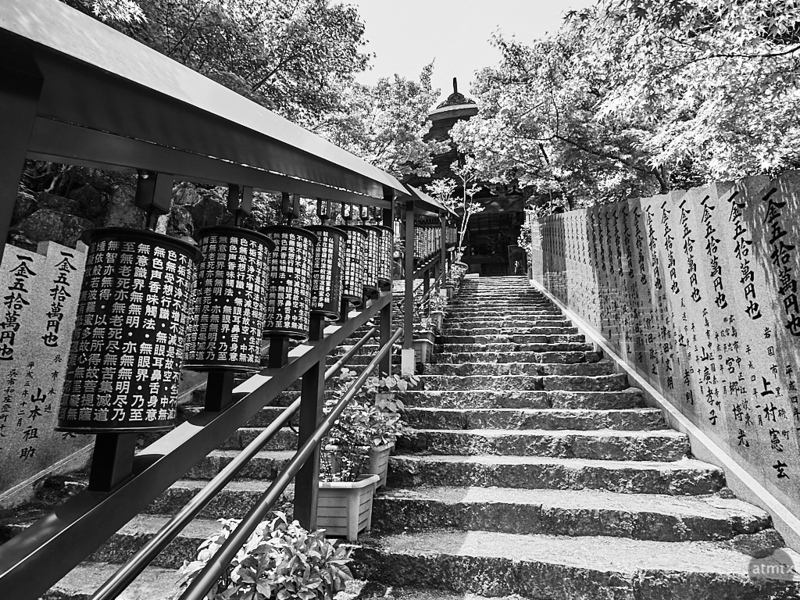 For today’s photo, I feature one the staircases with built-in prayer wheels. I’m told spinning these wheels are supposed to bring good luck. I didn’t do any spinning but I did make dramatic wide-angle images which further enhanced leading lines. I was back using my Olympus PEN-F fitted with the Olympus 9-18mm lens.